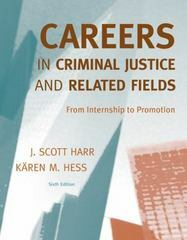 theclockonline students can sell Careers in Criminal Justice and Related Fields (ISBN# 0495600326) written by Christine Hess Orthmann, J. Scott Harr, J. Scott(J. Scott Harr) Harr, KÃ¤ren M. Hess, K?ren M. Hess, KÃ¯Â¿Â½ren M. Hess, Karen M. Hess, KÃ¤ren M. Hess, K?ren M. Hess and receive a $7.98 check, along with a free pre-paid shipping label. Once you have sent in Careers in Criminal Justice and Related Fields (ISBN# 0495600326), your Plymouth State University textbook will be processed and your $7.98 check will be sent out to you within a matter days. You can also sell other theclockonline textbooks, published by Wadsworth Publishing and written by Christine Hess Orthmann, J. Scott Harr, J. Scott(J. Scott Harr) Harr, KÃ¤ren M. Hess, K?ren M. Hess, KÃ¯Â¿Â½ren M. Hess, Karen M. Hess, KÃ¤ren M. Hess, K?ren M. Hess and receive checks.